This page is meant to be a short tutorial on how to build a Pd external in Apple's Xcode. 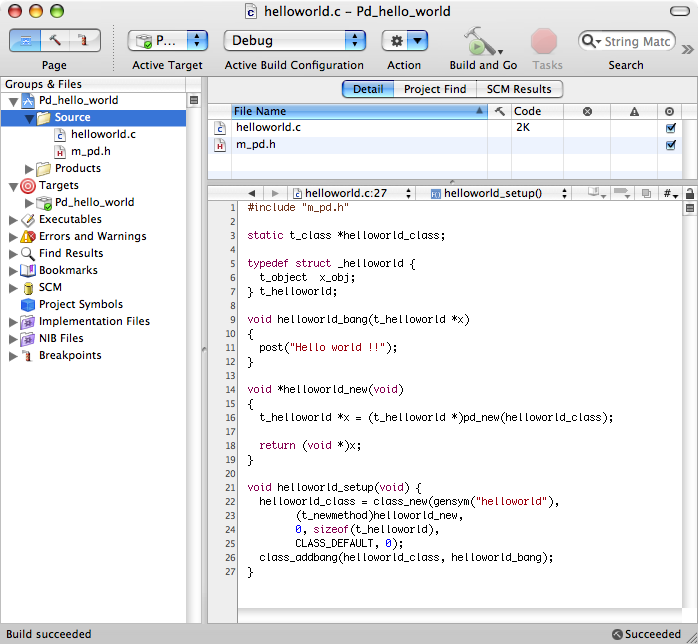 In particular, it explains how to build the "hello world" example from the Pd externals Howto. The following is what has to be done in Xcode 2, nevertheless Xcode 3 is quite the same in this respect. First of all, you need to download the Pd source code from the downloads section and unpack it. As far as this tutorial is concerned, the actual location of the files doesn't matter, but we'll need the source code later to invoke m_pd.h. Having started Xcode, first create a new project. 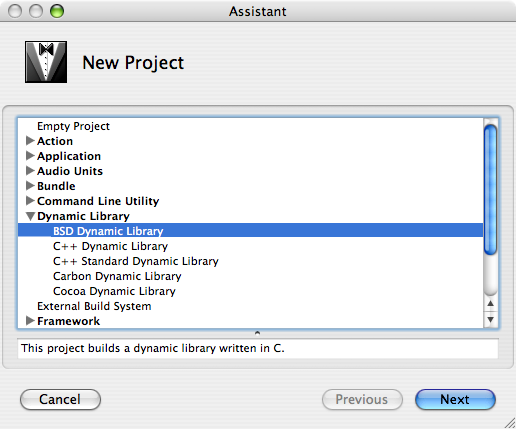 the project type you're looking for is "BSD Dynamic Library" in the "Dynamic Library" section. m_pd.h Look for it somewhere in the pd source code, add it to your project (the easiest way is to drag it from the Finder into the "Source" folder) and just click "yes" on the "Add to target" dialog. create the file via File > New File > C File (in the BSD Section) - you don't need to create the corresponding header file. Just copy the source code from the externals-howto into it and save. Nothing more to say about this - just be careful with the "Debug" and "Build" settings - you could have changed the target settings for one and try to build the other. The external should be available now.